Pat you left off the audio where she said she would be sending legal letters…that’s a threat….in my book. Kelly and her ilk will twist like snakes in their efforts to feather their nests and those of their union mates…they are arrogant and shameless. We the people,and the owners of the ports can see who’s on the up and up in this issue…and it ain’t you Ms Kelly…Some of us remember the threat you posed to the filming of The Hobbit happening here…. You’re not anti-union but in this dispute you’ve taken the side of management. Hmmm that’s despite the fact that they’ve released personal information about a port worker, information pertaining to his then sick wife. I can only assume you don’t need to be a Christian to work for Rhema. What are the facts she claims to have shared with you? I haven’t actually spoken to Ms Kelly Mark, so can unequivocally say that she has shared no ‘facts’ with me. gosh this seems to be a terrible over-reaction from Helen Kelly. Ross I struggle to see how you justify your comments about taking the side of management – it seems to me that Pat is simply highlighting an over-reaction and threats from Ms Kelly. Pat’s comments hardly warrant yours. So the Company did the right & legally obligated thing by the giving a worker paid time off to look after his dying wife & then to go through the grieving process w/ his children. Good on them. 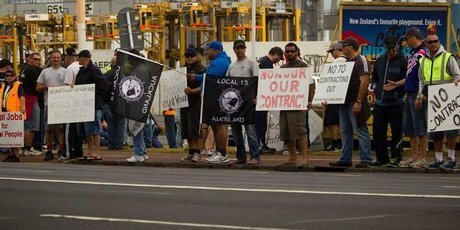 Now under the contracts the Port wants the worker to sign how much paid sick, compassionate & grieving leave would a worker have in the same situation. NONE. So don’t give me the this is a great caring company line. They are not. Jesus was very clear; Intrangisent with the Merchants and the Business people of this world. His testimony is clear about his views of the struggles of the poor, and when someone take the side of the oppressor abandons the Word and His teachings.